Vidsys is excited to announce that we were given a ‘Solution Partner of the Year 2017’ award from Milestone Systems at its recent MPOP Middle East 2018 event on May 11th in Dubai. Phil Stockham, VP of Operations EMEA at Vidsys, received the award on behalf of our regional team. This award recognizes the volume of mutual successful reference projects and customers Vidsys has in the safe city, critical infrastructure and enterprise sectors alongside Milestone. It also highlights the complementary nature of Vidsys and Milestone technologies to power large-scale deployments through a best of breed approach to security with VMS, combined with Converged Security and Information Management (CSIM) situation management software. 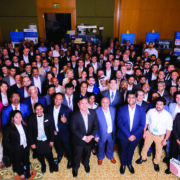 Vidsys and Milestone have been able to achieve monumental success on various projects throughout the region by working closely and coordinating efforts across teams. The Vidsys team sends a big thanks to Milestone for recognizing the value of our partnership, and we look forward to continuing to collaborate and innovate together! Vidsys is excited to announce that we have been nominated for the Northern Virginia Tech Council’s (NVTC) Hot Ticket Awards for 2016. NVTC is the largest technology council in the nation, serving 1,000 companies and organizations; including businesses from all sectors of the technology industry, service providers, universities, foreign embassies, non-profit organizations and government agencies. The Hot Ticket Awards showcase the most innovative companies in the Greater Washington region’s tech community who have exhibited great vision as well as the ability to innovate, grow, and excel in their respective markets. Taking place in June, the 2016 NVTC Hot Ticket Awards will combine the hottest companies and unbeatable networking with an exciting new element. For the first time, the awards will incorporate an online competition, with categories including Big Data and Analytics, Consumer and Enterprise, Cybersecurity and Safety, and Health IT and Wearables. Vidsys was nominated in the Cybersecurity and Safety category for our innovative approach to physical security that has evolved to include the ability to address the needs of Information Technology and other market areas. While our PSIM solution has been used in a security context by Fortune 500 companies, municipalities, US and international governments, military agencies, and special events, it is increasingly being used to support business process needs such as in manufacturing, healthcare administration, property management, retail and many others. Our platform’s ability to provide data correlation along with a visualization layer, makes our solution particularly well-suited to the explosive growth of IoT. Our Converged Security and Information Management (CSIM) platform integrates data and events from cyber security, building management, utilities, supply chain management, social media and other IoT-based sensors. These capabilities position us in a new and more competitive technology area. Voting opens June 6th and will stay open until June 9th. Click here to vote on The Washington Post! We look forward to participating in this event and promoting the groundbreaking tech innovation happening in Northern Virginia and across the Washington region. VIENNA, VA ─ July 9, 2012 ─ VidSys, a leading provider of Physical Security Information Management (PSIM) software, today announced that business research and consulting firm Frost & Sullivan has named VidSys a Tier 1 PSIM+ market leader. In a new report, Global Physical Security Information Management Market – A Global Trend Changing the Way Security is Considered, Frost & Sullivan analysts have defined, for the first time, three levels of PSIM software solutions: PSIM+ (Tier 1); PSIM (Tier 2); and PSIM lite (Tier 3). By establishing this new, tiered hierarchy, Frost & Sullivan provides clarity around an increasingly vast disparity of capabilities that numerous firms advertise as PSIM. As a PSIM+ solution, the VidSys software platform ranks among the most sophisticated and comprehensive PSIM offerings with customer installations in both the public and private sectors worldwide. Frost & Sullivan’s report highlights rapid anticipated expansion of the global PSIM market – a 34.6 percent compound annual growth rate, reaching $2.79B by 2021. It further highlights smart cities and smart infrastructure as two market segment applications that will contribute to this rapid growth. The VidSys PSIM software provides automated tools needed for safe, effective and timely resolution of situations triggered by basic alarms or multiple simultaneous alarms, events and complex incidents, thus reducing costs and improving efficiencies. The software includes numerous innovations and powerful off-the-shelf capabilities. For instance, it can plot alarms onto 3D views of cities or buildings offering users the ability to “fly in” to the precise location of an incident, automatically bringing up area video feeds and other relevant information to resolve quickly alarm situations. Another example is VidSys’ integration with multiple operational systems – such as CAD, access control, building management systems, elevators, and HVAC technologies. VidSys’ industry-first mobile PSIM application also advances field collaboration capabilities by providing a user-friendly interface designed specifically for responders, who require real-time information as they manage unfolding situations. In short, actionable intelligence generated by the VidSys PSIM software enables more effective emergency and security responses, breaking down institutional silos and facilitating immediate sharing of real-time information among security and other operations personnel. To purchase the full Frost & Sullivan report, click here. Frost & Sullivan, the Growth Partnership Company, partners with clients to accelerate their growth. The company’s TEAM Research, Growth Consulting and Growth Team Membership™ empower clients to create a growth-focused culture that generates, evaluates and implements effective growth strategies. Frost & Sullivan employs over 45 years of experience in partnering with Global 1000 companies, emerging businesses and the investment community from more than 30 offices on six continents. For more information about Frost & Sullivan’s Growth Partnerships, visit www.awards.frost.com. © 2019 - Vidsys, Inc. All Rights Reserved.